Esler, Stephens & Buckley, LLP is a limited liability partnership composed of Michael J. Esler, John W. Stephens and Kim T. Buckley (recently retired partner emeritus). The Firm has a diverse, multi-jurisdiction practice in the areas of complex business litigation (trial and appellate work), antitrust, public utility law, real estate litigation, intellectual property (patent litigation, copyrights, trade secrets and trademarks), business and nonprofit corporations, condemnation law, toxic torts, environmental law, securities fraud on behalf of investors, accounting malpractice and oppression of minority shareholders. The Firm’s practice is unusually sophisticated and varied for a firm of its size, as the list of reported cases (see “Achievements”) attests. The Firm’s lawyers have the highest rating attainable from Martindale-Hubbell (A-V), and all three partners are Oregon “Super Lawyers.” Mike Esler was honored by Best Lawyers in America as Portland's “Lawyer of the Year” in securities litigation for 2012, and recently was invited to join the elite International Society of Barristers. The Firm's clients are diverse, reflecting the Firm's practice. The range includes large companies such as Pacific Seafood, Honeywell and Northwest Natural Gas and government entities like TriMet, the City of Bend, and the City of West Linn, to smaller regional businesses (Pewag Chain), nonprofits (Sunriver Owners Association, Eckankar) and on trademark matters, Mary's Woods at Marylhurst, and restaurants like the former San Francisco landmark restaurant, Stars, celebrity chef Bradley Ogden's former restaurants – Funky Chicken, Hops & Harvest and Ogden's Pour Society, and Portland's own super chef David Machado's spectacular new rooftop restaurant Altabira. The Firm represents many individuals as well, from CEOs, NBA players and highly regarded chefs, to hundreds of investors from all walks of life who have been victimized in some of the Northwest's biggest frauds, like Capital Consultants, Pac Equities, Sunwest, Willamette Development Services, Iris Capital, the Grifphon/Sasquatch hedge funds, Berjac and Aequitas. Gary, Kim, Mike and John on a recent day when they all showed up unintentionally wearing pretty much the same thing. 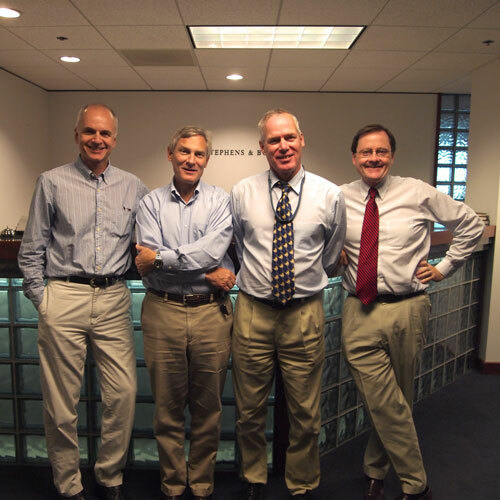 The Esler, Stephens & Buckley team has practiced together for more than 30 years. Christine Ortez has 15 years' experience which includes working on some of the largest investor fraud cases in the Pacific Northwest. Anayeli Nieves-Alvez has been with us for two years, and is involved with most every case we are working on. Copyright © 2010- Esler, Stephens & Buckley, LLP. All rights reserved. Website by Mad Bird Design.